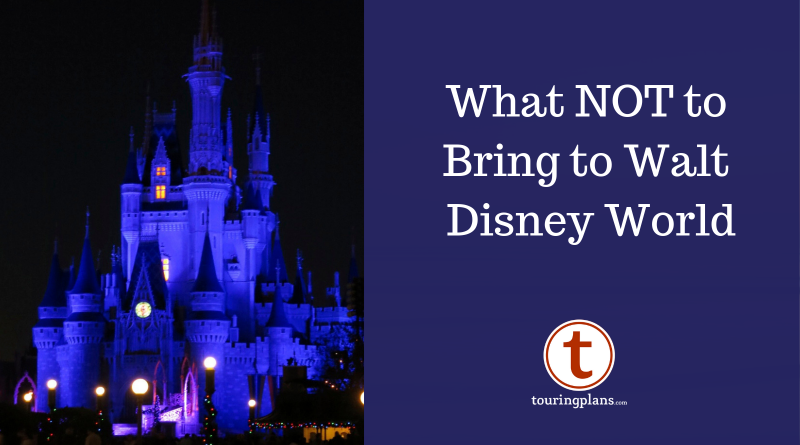 We recently posted a review of items that you may want to bring with you into the Walt Disney World theme parks. The flip side of that topic is understanding what items you can’t bring into the parks. Not all the prohibited items are intuitive, and this list does change from time to time, so a review of current policies is prudent before any Disney World visit. As I mentioned in the “what to bring to the parks” article, all guests entering the WDW theme parks are subject to a security screening. Bags will be searched and you may be asked to walk through a metal detector like at the airport. If the security search uncovers any of the items below, you will (depending on the item) be asked to return the item to your car or hotel room, have the item confiscated, or, in the case of weapons and illegal substances, be detained and referred to an appropriate law enforcement agency. Let’s start by with a the basic list of prohibited items and then I’ll discuss specific issues with some of them. Some of these items make sense at face value. Don’t bring illegal substances into a theme park. Just don’t. Marijuana may be legal in your home state or country, but even lawfully prescribed medical marijuana is not allowed at Disney World. Understandably, you are not allowed to bring weapons into the theme parks. Disney stopped selling replica and toy guns in late 2015, including items such as water pistols. However, there are a number of places in the theme parks that sell items that could be actual weapons. I’m specifically thinking of the very real looking swords sold in the China, Japan, and UK pavilions at Epcot. You can buy those items at Epcot, but you could not then take your purchase with you into another theme park. 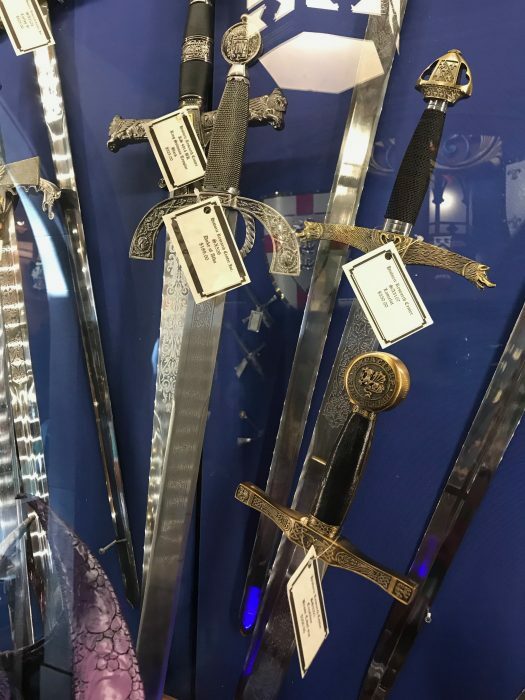 Swords for sale in the UK pavilion at Epcot. Other areas of possible confusion involve alcohol, glass bottles, and alcohol in glass bottles. You can now buy adult beverages at restaurants at all four WDW theme parks. So, while you can consume alcohol in the parks, are not allowed to bring it into the park yourself. 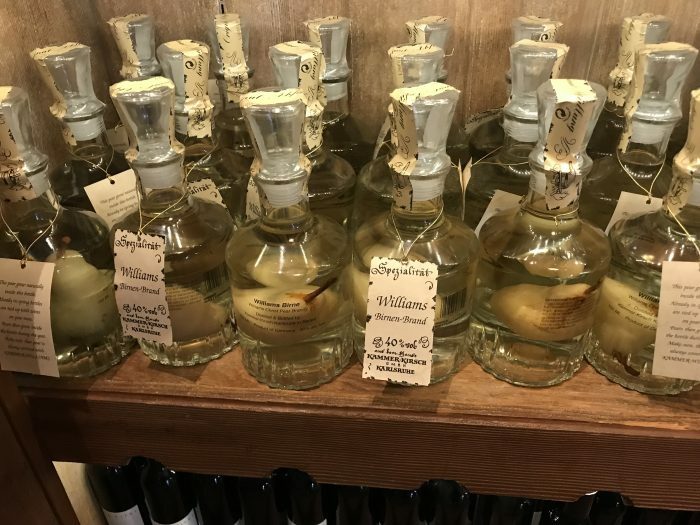 Additionally, wine, moonshine, saki, beer, and a number of other forms of hooch are sold in the theme park gift shops, most notably in the World Showcase area of Epcot and at the Epcot Food & Wine Festival. You can buy a glass bottle of wine in the theme park, but if you then wanted to Park Hop to the Magic Kingdom with your purchase, you would be stopped at the entrance. Similarly, there are other food items such as olives, pasta sauce, and soft drinks that are sometimes sold in the Epcot shops in glass jars that you would be prohibited to bring to another park. Disney does have a free service that allows guests to send merchandise purchased in the theme parks directly to their WDW hotels. However, be aware that they will not transport food with this method, so you will have keep your food/wine purchase with you. If you arrive at a WDW theme park with glass or alcohol purchased in another theme park, they may store it for you at guest relations or the park package pick-up area IF you have a same-day purchase receipt and the item is in Disney parks packaging. (Thanks to Amy H of the Disney Parks Moms Panel for doing a deep dive into researching this for me.) But this will take you extra time both when you’re entering and leaving the park. To simplify your travels, if you’re buying alcohol, or any other product sold in glass, you should plan do to this at a time when you have a car you can leave it in or when you’re heading back to your hotel rather than when you’re hopping to another park. Brandy sold in Epcot’s Germany pavilion. 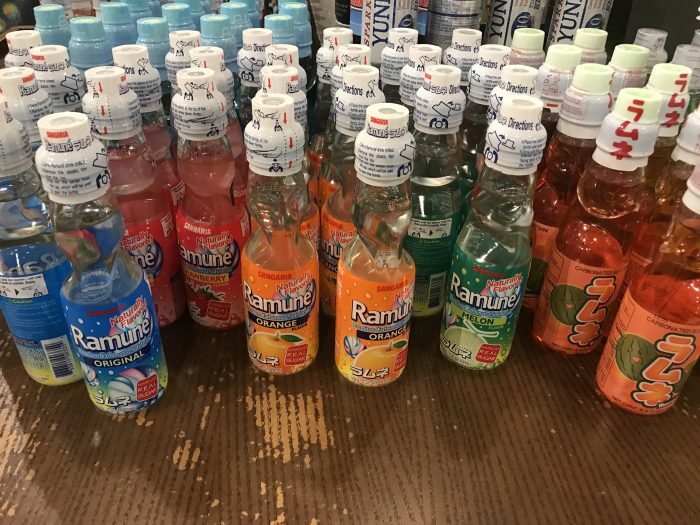 Glass bottles of soda sold in Epcot’s Japan pavilion. You cannot transport this into another theme park. Many of the other items on the prohibited list involve safety issues. Skateboards, skates, scooters, and similar have the potential to induce falls or crashes. Selfie sticks, tripods, folding chairs, oversized strollers, and large suitcases may all impact the movement of other guests. Remote control toys also fall into this area, and are another category of items that is sold in the parks (remote controlled Star Wars droids and Cars cars have been sold throughout WDW), but cannot be transported into another park. However, unlike the issue with food and wine, Disney will send toys your hotel for you via their free package pickup service. If you’re park hopping, this a great way to avoid issues at your second theme park. Also be aware of the Animal Kingdom’s prohibition against balloons, a measure designed to protect the animals from errant plastic debris in their habitats. Don’t buy a balloon at the Magic Kingdom if you’re planning to immediately hop to the Animal Kingdom. In addition to Disney’s list of items prohibited in the theme parks, there is also a list of activities prohibited in the parks. 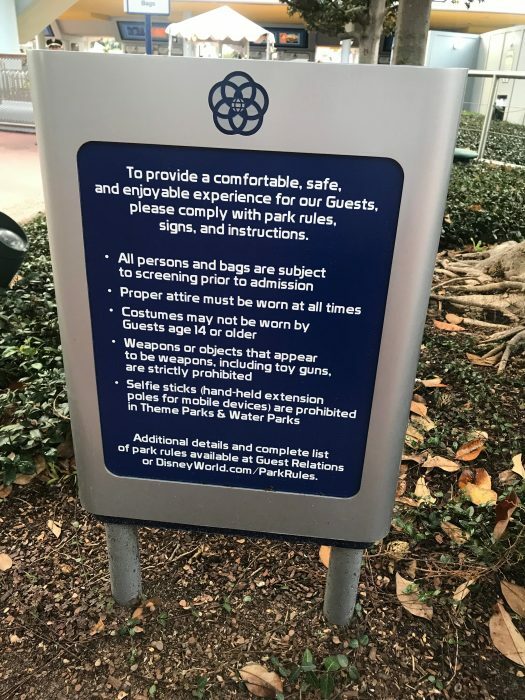 I include this list here because several of the prohibited activities have oblique mentions of items that should not be brought into the parks such as: quantities of sales materials, political banners, and professional-level adult costumes. You’ll note that, other than alcohol, food items are not on the prohibition lists. You are welcome to bring food and beverage items of all sorts into the parks with you, assuming they’re in appropriate (non-glass) containers of appropriate size (no oversized coolers). Many guests do bring refillable water bottles, snacks, fruit, sandwiches, and the like into the parks as a means of saving time and money, or to accommodate family members with food allergies, religious requirements, or personal preference. Are you surprised by anything on Disney’s list of prohibited items? Have you ever had anything confiscated at the parks? Have park entry prohibitions influenced your WDW purchases? Let us know in the comments below. EDIT: A few days after this was published, Disney amended some of its policies on park prohibitions. Notable items include a ban on all smoking within the parks and a rededication to enforcing stroller size/shape restrictions. 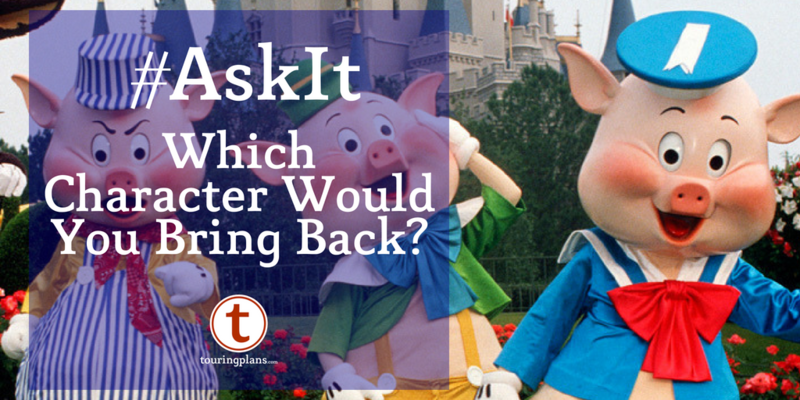 #AskIt – Which Characters Would You Like To See Back At Disney? If you park hop *directly* between Epcot and the Magic Kingdom via monorail, you stay inside the security check “bubble” the whole time, and are not subject to an additional bag search before entering the park you hopped to. You would be violating Disney policy by entering the 2nd park with a glass bottle/jar or RC toy in your bag, but in this specific scenario, nobody would stop you from doing so. Fair point. Currently, if you park hop directly between Epcot and the MK using the Monorail, you are not subject to a second search. However if you use some other form of transportation (an Uber perhaps) you would be searched a second time. And it’s always possible Disney could change the locations of its checkpoints. But yes, you are correct. I can’t speak for everyone’s experience, but I passed through security at TTC prior to riding the monorail to Epcot. Upon disembarking, the ramp exit for the monorail emptied into the security lines that checked guests coming from the bus stops. So we were checked again. This was in February 2019. At the time, I wondered if there would eventually be a change to the layout of security since the monorail was full. Happy that you reviewed this. Wondered who and how these rules are enforced, especially the behavior part. I have heard people swear and threaten others at the parks. Those strollers seem to be getting larger as well (saw a Walmart ad for a seven passenger “stroller”). Interesting. Things like swearing are enforced on a case by case basis, depending on how disruptive the behavior is. I confess that I have occasionally let an improper word slip and not faced consequences. However, the policy is in place should a guest become loud and effusive with rough language. And threats should be reported to cast members as soon as possible. As for the stroller size issue. Disney seems to be aware that this is becoming a problem. Just this morning Touring Plans fearless leader Len Testa tweeted: “Am told WDW and DLR will start enforcing stroller size limits May 1: 31″ by 52”, including a “no wagons” policy. Seems to be addressing strollers like the Keenz 7s?” So, it looks like they’re stepping up enforcement of their policy here as well. Great list, Erin. Thank you. I understand the reasoning for the selfie stick rule but its so annoying. I have a travel tripod where the tripod bottom is detachable, making it a monopod and it tends to be 50/50 whether they’ll let me take it in or not really just depending on someone’s mood of the day. Darned youngsters. We had monopods long before selfie sticks! I’m curious about how the “no photography, audio recording or video recording for commercial purposes” rule affects your work here. I’ve seen all three of those things appear on this blog and website. Does WDW consider those to be auxiliary to this commercial venture and not something you are selling directly, or do you have some kind of special license?